Those crazy scientists, always up to something. 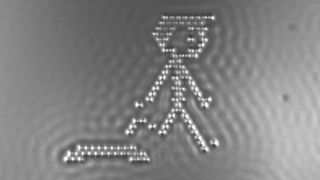 Now they've only gone and created the world's smallest movie using nothing but carbon atoms. The film, named A Boy and His Atom, consists of almost 250 stop-motion frames and lasts less than 90 seconds. On the face of things, it's a simple tale but there's definitely a deeper, more nuanced subplot dealing with themes of existentialism and teenage angst. It might be the strangest and most awesome thing you'll see today, so check out the video below and marvel at how far science has come. You know what else is awesome? Our blips.